Essilor, Helping The World See Better! The 160 years old company, the world’s most superior in spectacle lenses has been hugely successful around the world because of its single minded obsession to bring the best in lens technology, training, equipment and dispensing to its wide network of more than 350000+ ECPs spread across more than 100 countries. 2.5 billion people in the world suffer unnecessarily from poor vision and its consequences which is why Essilor’s mission is, ‘Improving Lives by improving sight’. Essilor was created by the merger between co-operative inspired ESSEL and the entrepreneurial SILOR and two landmark innovations– the introduction of the plastic lens-a safer, lighter and stronger material – and the invention of the progressive lens, Varilux. In the last 5 decades Essilor has expanded its production and distribution networks across 5 continents and accelerated its technological innovations to benefits consumer. All the actions at Essilor are guided by a single truth: Vision matters because good vision, benefits people throughout their lives. It is by inventing and offering innovative solutions from products and equipment to training and distribution, that will help reverse the global trend of poor vision and continue to create value for the Eye Care practitioners. Essilor India is a 100 percent subsidiary of Essilor international and has been in the service of the Indian opticians since 1998. Crizal, Varilux, Transitions are all well known consumer brands in India. All of Essilor’s products straddle 3 platforms – Vision Correction, Vision Protection and Prevention. Traditionally consumers are probably more interested in choosing their frame than their lens. This is changing quickly thanks to the information provided by the opticians and the power of the worldwide web. Consumers today have a fair understanding of what they need and some of them will come to the ECP with a brand in mind. A successful optician of the future will be the one who puts all the options of lens technology in front of his consumer and helps him decide the best option based on the need and lifestyle. For the optician constantly updating himself on new technology and using demo tools, sales aids, dispensing instruments to show customers the lens property will be the key to success. Based on clinical studies, it is suggested that long-term exposure to the sun’s harmful UV radiation may be linked to the formation of cataract, and cited as one of the possible contributors to age-related macular degeneration and other ocular diseases. However, most lens wearers cannot accurately assess the risk of exposure to UV radiation. Patients are not aware of the fact that UV radiation is always present regardless of the intensity of visible light from the sun, even if it’s not a bright sunny day this is where the ECP shares his knowledge. Crizal provides complete UV protection both front and back UV protection and it comes with the easily understood consumer rating of ESPF (Eye Sun Protection Factor). And now with its latest innovation Crizal Prevencia one can have access to the first lens that provides protection from harmful UV and Blue Violet light. That’s not all, Crizal Prevencia is different from other blue cut lenses because it does not cut all blue light and it allows the good blue turquoise light into the eye. This blue light is important for the body to maintain its rhythms of sleep, hunger and mood. 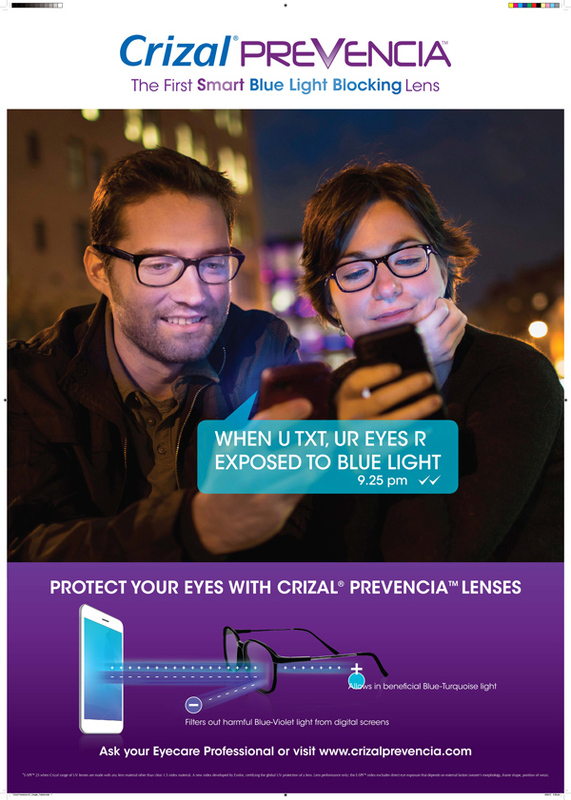 Superior Crizal Prevencia lenses are the most advanced blue light lens that helps protect the eye from harmful blue wavelengths that might cause degeneration of retinal cells, while allowing through beneficial blue light. Whether customers wear spectacles or not, the hours spent every day in front of screens with different light intensity and font sizes have multiple impacts on their eyes. Eye strain, headaches, blurred vision are common symptoms, along with neck and back pain. Today more than 90 percent of people aged 20 to 65 years use digital devices daily and on an average switch between at least 2 devices and spend a minimum of 5 hours on these devices. “A few years ago, the main cause of visual strain was continuous usage of computers. But in today’s modern age, we are using a computer, a tablet, a smartphone, an e-reader as well as the good old television all at the same time. This does not just increase digital exposure of the eye, but adds extra pressure on the eyes as they continuously switch between devices and adapt their focus while sitting, standing and lying down. Eyezen lenses are specially designed for a digital lifestyle which is a major innovation from Essilor, offering users the maximum protection and comfort” says Mr. Shiv Kumar J, CEO, Essilor India. These lenses help you relax and protect your eyes. Eyezen lenses come with a power booster which helps the eye relax and avoid strain and with the new Crizal Prevencia light filtering technology, the eyes are protected from harmful blue-violet light emitted by digital screens as well. Eyezen can also be prescribed for those who have no visual defects and who simply want relieve and help protect their eyes every day. Light plays an essential role in our everyday life and eyes are exposed to UV rays, harmful blue light and glare. As part of visible light, blue light passes through the eye reaching the retina. Due to its higher level of energy than the other wavelengths in the visible spectrum, it is potentially harmful to the retina. Sunlight is by far the strongest source of blue light as it is at least 100 times greater than any artificial sources. Help protect your consumer’s eyes from the impact of blue light exposure with Transitions® lenses™. Why shouldn’t the first pair of spectacles your consumers wear help protect them from the harmful effects of glare, UV and blue light? Transitions Adaptive lenses provide 100 percent automatic UVA and UVB protection both indoor and outdoor, as well as adjust their tint to suit the level of brightness from visible light. They are also protecting you from the harmful blue light while letting the good blue light to pass through the lens. They provide you with absolutely clear vision thanks to the glare protection and their fast darkening and fade back ensure that you are stylish at all times. The consumers aging more than 40 years today are willing and able to afford luxuries for themselves. Their vision is changing because of the change in lifestyle as they spend more time on digital devices, they work longer hours and suffer from tired eyes, shoulder and back pain. But 8 out of 10 are not very clear how wearing progressive lenses can give them back the vision from their youth. Essilor invented the very first progressive lens – Varilux – in 1959. Since then, the goal is helping consumers achieve the most Natural Vision Possible. That’s why over 400 million people have chosen Varilux lenses. We’re constantly pushing the boundaries of innovation to bring more sharp and natural vision in the way your customers live, work and play. Live Optics is what sets Varilux lenses apart from all other progressive lenses, other lenses rely completely on computer testing to determine the success of the design – whereas for Varilux the consumer is at the heart of every lens and we test our designs on live wearers. Every Varilux progressive lens undergoes a rigorous series of wearer trials and testing to ensure the best performance possible. Varilux with its patented designs and different technologies like Nanoptix, Synchroneyes, Wave technology, Path Optimiser among a few allows you to prescribe a lens that is perfect for your customers visuals needs. You are now able to successfully prescribe a brand with the highest rate of success among presbyopes. Varilux helps you and your patients Stay Focused. “The cumulative stress on the eye today is much more than it was five years back when smartphones and tablets were yet to become a norm. In such dramatically changed circumstances, Essilor will always bring in the best solutions for opticians and consumers to enjoy this connected digital world and enhance prevention of enemies of good vision in the coming years”, says Mr. P Ramachandran, Group COO, Essilor India.